Until recently I did not like sweet potatoes very much, I guess it was due to the variety that I used to have but now we regularly eat the orange fleshed variety. This is quite quick and easy to cook, and despite its naturally sweet taste works well with strong savoury flavours. This particular variety is said to be rich in antioxidants vitamin C and beta carotene, which can help to enhance memory, so it is a good food to give to growing children. When my son started weaning I had got a few books from the library which helped give me ideas of what kind of food to give him. Certain foods are very common to give to children when they are at this stage. Foods rich in carbohydrates are very common but rather than the normal basic potatoes, I increasingly started using sweet potatoes because, as mentioned above, they are good for us. I used to just boil and mash them and then slowly I started adding salt, pepper, lemon juice, ghee (clarified butter), olive oil, rosemary and lightly sautéing them giving a very good added nutty and slightly caramelised flavour. For quite some time now I have seen many recipes for sweet potato soups, but never actually got around to trying any of them however yesterday I thought I would give one of them a go. 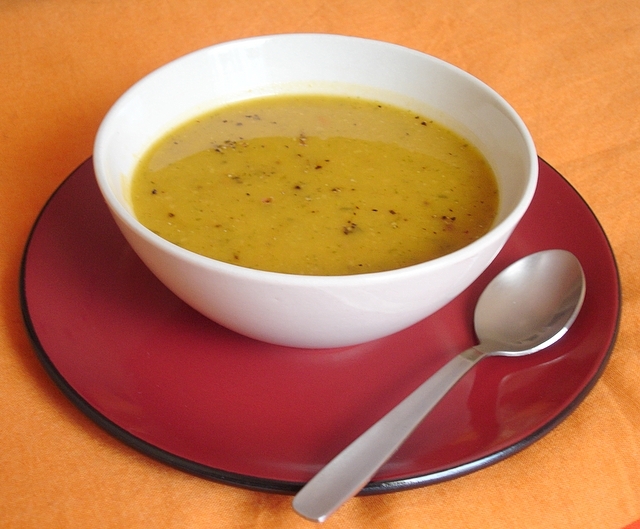 I had to change the recipe that I choose as I did not have all of the ingredients but it turned out to be a sweet and subtly spicy flavourful soup, not to mention satisfyingly filling. It is very quick and easy to make and I think it is a good meal to have if you are trying to be healthy or wish to eat a light meal. I would say in the current cold weather it certainly warms you up. As I was making it I came up with a few ideas of how to make it different, for example by simply adding red Thai curry paste and soy sauce, it could be turned into an oriental soup. 1) In a large heavy bottom pan heat the oil and place all the vegetables, ginger, chilli and garlic and saute for a few minutes. The edges of the vegetables should turn slightly brown, in the mean time boil some water in a kettle. 2) Dissolve the stock cube in half of the hot water, and one teaspoon of the peanut butter. Pour into the pan and let it come to the boil, cover and cook for a while. In the mean time chop the tomatoes and then place them into the pan. 3) While that is simmering, chop the coriander and place into the pan, simmer for a while and check for seasoning and add if required. By now your vegetables are cooked and very tender, blend in a liquidiser or hand blender. I love sweet potatoes and this looks like a great recipe! One question – can I use another nut better, i.e. cashew or almond, as I have a peanut intolerance? (I break out in hives if I eat peanuts). Kiran ~ You can use cashew nut butter if it is free from peanuts. If not I would say just dry roast some cashew nuts first, grind them slightly and then add them at the end. I am sure you will have a much creamer taste. Kiran ~ The curry like flavouring is so subtle that you hardly notice it, but gives it a good kick especially if you add more green chillies (which is what I am planning to do when I make it next time). this sounds good and glad you tried it…I also did not like mole the first time, but now that I made it and can see a variance on the recipes to try, I give them another shot…I love sweet potatoes in any shape or form…baked fries work to! Kiran ~ I did see that on your site and thought maybe one day I will try out along with a long list of other things 😉 I have yet to try making sweet potato fries.